There are lots of different elements that you can accomplish with a .htaccess file. They can create redirects, rewrite urls, and password protect directories. You can even implement them to protect your bandwidth and website assets. A .htaccess file is a way to config rules on your web server running Apache Web Server. With the file loaded in your index directory of your site, it will be detected by Apache and executed. The default name is .htaccess, and must be name exactly like this to be usable. This file is mostly used for rewriting URL structures and redirects. How to create the file? Creating a .htaccess file can be tricking on a client Operating System. The easiest way to get the file to work with the "dot" extension. Is to create it in a standard text editing program and upload it to your server. To create one, use a standard notepad editor. Make the necessary changes and save as "All Files" .htaccess. Then upload the file to the root directory of your server. Check you CHMOD permissions and see if they are 644 (RW-R--R--). Some web hosting server will not allow you to use a .htaccess file. Double check with your web hosting provider if your file is not working. Open your text editor software. Enter all custom rules and commands. File Save As, choose "All Types" as save type. If you are having problems with the instructions on how to create .htaccess file. You can download my exmaple file to get your progress kick started. Here are a few of the most common commands that are used with a .htaccess file. Default setting that are commonly used. 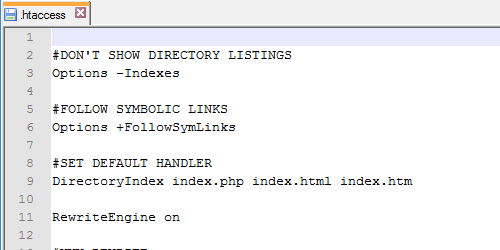 Send user to specified index page on a website error. These commands will prevent certain IPs and websites from accessing your website. This command will give you the ability to change what your index file goes to when accessed. Hot linking is when someone is accessing your images from your server and using your bandwidth. Most servers support Gzip caching to compression the size of your site. ExpiresByType text/html "access plus 30 seconds"
ExpiresByType text/xml "access plus 1 month"
There are even more elements you can accomplish with .htaccess. These are just some of the most common features web developers use on a daily basis. It’s a good idea to know some of these tricks to manage your website. Do you have any .htaccess tips you would like to share?